One day we noticed a male quail standing in the middle of our driveway. He would occasionally take a step or two toward the foliage in the driveway island, then pause again. Looking from an upstairs window, Tom noticed movement in the island. Then, Cathy saw the 'leaf' in the driveway scurry toward the island. 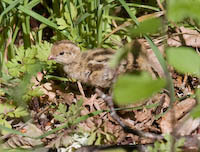 We had a family of quail -- including very small, fluffy, adorable babies -- living in our yard! 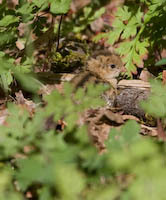 After several failed attempts (the parents are very vigilant and quail hide very effectively), we managed to get some photos of the chicks. These photos were taken with a Canon EOS 30D using a 100-400mm zoom lens. Focal lengths were between 235mm and 400mm. The camera's CCD covers only the center portion of the lens, resulting in an effective 1.6 multiplier (for an equivalent zoom level of 376mm - 640mm). 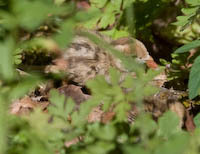 There were about a dozen chicks, but they were in constant motion and tended to blend very well with their environment (as you can see from the photos below). 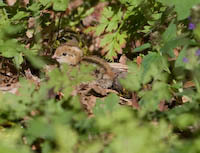 Two quail chicks; note the teeny feet.